Anne Jacobsen's story, "Terror In The Sky" from WomensWallStreet.com and FrontPageMagazine.com is being scrutinized pretty heavily across the blogosphere today. The gist of the story is that Anne, her husband and son recently flew cross-country from Detroit to Los Angeles on Northwest Airlines. 14 men of Middle Eastern origin boarded that flight as well. A series of bizarre events occured on the flight, including the "congregating" of the men in the rear of the plane, musical instrument cases and a non-descript McDonald's bag that went missing. Supposedly, the pilot was aware of these activities; supposedly there were multiple sky marshalls on the flight. The flight flew unimpeded to Los Angeles. The men were supposedly detained by federal authorities, and everyone else rather quickly and suspiciously "dummied up." The story smells. I'm not going to go as far as to say that it is completely trumped up, but I have to ask whether author Jacobsen took some literary license with at least portions of the story. After all, that sort of embelishment would certainly draw more attention to an air security system that is obviously lacking across the board. Many other folks are watching this story today; Michelle Malkin is head and shoulders ahead of everyone else in covering it. UPDATE: I'm still cynically skeptical, but Michelle has done some additional sleuthing (and thank you, Michelle, for your dilligence! If my I'm wrong in my skepticism, your work may well save lives!). I asked Jacobsen if she talked with other passengers. She said no. I also asked if she had heard from other passengers from her flight in response to her story. She said she hasn't. 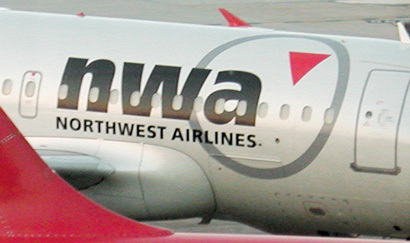 If anyone else out there was on Northwest Airlines flight #327 from Detroit to Los Angeles Flight on June 29, 2004, departing at 12:28 p.m., we'd love to hear from you. Far be it from me to poo poo healthy skepticism, but I think you're wrong here. Per Michelle Malkin, big portions of this story have been confirmed by TSA. The WaPo and the Networks (at least NBC), are working on stories. The author is a financial reporter for a business website, not a political activist. The website apparently thought long and hard about publishing. This thing rings very true to me. You know me -- If I'm wrong, I'll 'fess up and take my lumps. Of course, this go 'round, I pray I'm right, 'cause if I'm wrong, then we've got a whole hell of a lot to worry about in the near future. I'm hoping that they were just praying. I say hope because the Muslims that I knew from college and from work wouldn't dream of praying in a none too sweet airplane bathroom but you never know or maybe this really was test run. Here is a great parody from Scrapple Face. (2004-07-17) -- A harrowing story of one man's experience with "terror in the skies" reached a global audience this week, as web surfers and bloggers circulated it, commented on it and challenged its authenticity. The first-person account starts before the unnamed man and 13 of his friends boarded Northwest Airlines flight #327, bound from Detroit the Los Angeles, on June 29. "We were just going about our business during the flight," said the man who was born in an unnamed, predominantly Muslim country. "You know, we were just reading the Koran aloud, carrying objects about the cabin and gathering near the restrooms to chat in our native tongues about the ultimate peace we'll find in Allah. Suddenly, I noticed this white woman staring at me. It really freaked me out. It made me and my friends so nervous that we had to use the restroom more, and of course take our digital cameras and other objects in there with us." The anonymous victim said he began to receive unwanted attention from the flight crew, and saw people passing notes to each other and exchanging glances. "My legs were like rubber," he said. "I don't know how we endured four hours of this kind of fear. Me and my whole cell group--you know, my friends--finally understood how the great martry Mohammed Atta must have felt during his final hours." The unnamed man said his only comfort came from knowing that he had "official permission from the U.S. Transportation Security Administration to be aboard that plane. I knew that they respect our religion and were protecting us." Presuming that Jacobson's story is accurate -- and I believe it is -- my trick knee tells me that what she witnessed was 14 US agents who were testing the response and reactions of the airline, the sky marshalls and the passengers. Think about it; 14(!) muslim men acting very very VERY suspiciously. They wouldn't send 14 terrorists on a suicide mission (or a dry run-through of a suicide mission) when only a handful are neccessary. And they wouldn't be so dang OBVIOUS about their movements and gestures. I believe now that Jacobson and her fellow passengers, the flight crew and the air marshalls were guinea pigs for a government inquery into how they all might respond to a possible threat. I'm not one to poo poo a theory when we just don't know the answer but I would like to point out one fact that has some consensus. There is a policy at the Air Transportation Dept. that says you can't "randomly" search more than two Arabs(that racial profiling thing) from a group... Yes, this sounds dumb and stupid, but this is what people are saying is the case. So putting 14 militant terrorists on one flight isn't completely beyond reason. Yep, I'm well aware of the two-middle-eastern-man-limit on the random searches. But, with 14 men acting so suspiciously, the crew and/or air marshalls could question/intervene at any time because it wouldn't be a "random" search at that point -- they had probable cause to act. Still, 14 is a lot of men to throw away on a suicide mission when only 3 or 4 or 5 would do -- even IF two of 'em were searched and "disarmed" before boarding. Michael's right that something about the story seems out of whack, and I think it's that the "terrorists" were so many and so blatantly acting like terrorists. Agreed that something isn't right about it. My impression is that the agents knew this was not a threat. Otherwise why would they not intervene on board the flight? Turning Spork, I think you might have the answer. "Per Michelle Malkin, big portions of this story have been confirmed by TSA." Hardly. Malkin didn't claim that either. Context people. More like general theme. (ie 14 Syrians were indeed on that flight, they were questioned at LAX, story checked out, let go. That's all). What do we know about Al Quida? We know AQ is persistant. They re-attack targets until they acheive the goal. We know they are patient. They will "sleep" agents in country FOR YEARS, where they learn to blend in, become respected, and establish identities before they are activivated. Applying this background, we know that AQ used teams of five for 9/11, and one of the planes still didn't make it to the target (failed). THEY KNOW that the rules of hijacking have changed, and that the passengers will no longer assume that their best chance to survive is if they cooperate, hoping they'll land in Beirut and be let go two weeks later. Passengers now operate under the assumption that if somebody tries to take over the plane, their only hope of survival is to take it back before it plows into another target. Thus, if the bad guys are planning, and thinking they would of COURSE use more than five hijackers next time, because the planes occupants HAVE TO BE SUBDUED BY FORCE... Tripling their efforts would not be unheard of towards this problem. They also know that planes now carry ANONYMOUS ARMED MEN in the form of Air Marshalls. The air marshalls MUST BE DEALT WITH prior to any take-over attempt's success. What better way to find out what the air marshalls will react to, and what they wont, than cause a disturbance (one clearly troubling enough that the flight deck radiod ahead for the police to meet the plane in L.A.)? They also know that there is now a steal reinforced door between them and the flight deck... They have to solve the problem of how to get past it? Perhaps if they cause a commotion, the pilot will come back to see what's going on? This ploy WAS USED on 9/11 to gain access to at least one of the flight decks. Perhaps it wasn't a dry run. Perhaps it was an actual attempt that was aborted BECAUSE the air marshalls didnt jump up and reveal themselves, making it possible for yet others lying in wait to attempt to disarm and overpower them? Yes, they could have been acting so blantantly like terrorists just to find out what response they'd get. Excellent points, TLABG. I thought it was a legitimate story at first. But think about it. The flight crew and the onboard air marshals were aware of the situation, and they did NOTHING? Didn't even ask the men to stop congregating around the lavatories? Something doesn't ring true. I think there's more to the story than we know. I disagree. The air marshals WOULD NEVER intervene UNLESS an overt attempt to take over the plane was being made. They are not bouncers... or hall monitors... The FAA policy is for them to not get involved or reveal themselves unless the plane is in imminent peril. After all, what could they do? They couldn't even arrest the men as no crime had even been committed. ANd if the bad guys were up to something, they now know who they have to kill FIRST... That doesn't make their behavior any less suspicious. The flight crew also did what it was supposed to do. They radioed ahead that something 'weird' was happening, had police standing by at arrival, and STAYED IN THE COCKPIT. all of you douter's have opinions. but i" ask you this' how many of you would have liked to have been on that flight? Let's please remember the only person who seems to be confirming anything about Ms. Jacobsen's story is a "journalist" named Michelle Malkin. Malkin has precisely the same political axe to grind as Ms. Jacobsen. This looks so much like SOP for the Vast Right Wing Yahoos that it isn't even funny. Don't people remember this kind of stuff during the Clinton era? You take an overly-hyperbolic story, get it published in some lame publication. Then have it "confirmed" by a seemingly independent "journalist" or series of "journalists".